South East Heavy Haulage are a newly established business based in North London forming in 2014, yet in the 4 years it has been operating, the company has gone from strength to strength with a firm customer base working on some reputable contracts in both the south east and across the UK specialising in the transportation of abnormal loads. Director Sean Maccurtain explains how continued membership of the FORS scheme has supported the business by helping to achieve the high standards expected within the industry. I first heard about FORS from a local transport consultant who explained the prevalence of joining the FORS scheme . Becoming a FORS compliant operation helped us to secure further contracts thus also continuing to provide an efficient service to existing contracts. 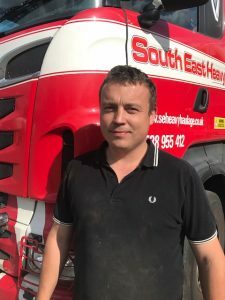 South East Heavy Haulage has always been a well organised operation which passed its Bronze audit in July 2015 first time, prompting us to progress onto FORS silver accreditation in March 2016 which gave me the necessary tools to structure and organise my business to then work towards Gold accreditation that was achieved in August 2017. “The achievement of the gold standard has helped us to secure contracts with well known, reputable companies” – Sean Maccurtain – Director. Since joining the scheme 3 years ago I feel that FORS has supported and equipped our operation to work in a heavily regulated industry. Some of our work is trackside haulage involving work for network rail, this requires annual accreditation and in this respect FORS with its focus on maintaining robust quality fleet management has helped secured such contracts allowing the business to grow. Since passing our first bronze FORS accreditation in July 2015 , I took advantage of the benefits on offer by becoming a member of the scheme to access further contracts which gave me an opportunity to grow the business and increase the fleet from 1 vehicle to 3. FORS gave me new ideas on how to manage my business such as monitoring and managing company fuel usage which has made me more aware of ways of reducing fuel usage. With adding the required safety equipment to the fleet and the undertaking vulnerable road user safety training, awareness of vulnerable road users amongst drivers has greatly improved, keeping South East Heavy Haulage a safe, efficient operation maximising the welfare of its operatives and other road users alike. We have kept our accident rate at 0% and we have reduced our Co2 emissions by a 10% and PCN fines by 66% as highlighted in the table below. As work levels have increased it has given South East Heavy Haulage an opportunity for further growth, I have purchased a new euro 6 truck to replace an older euro 5 truck, giving improved fuel efficiency and a reduction in Co2 emissions. In addition to this our drivers will continue to increase their knowledge and awareness of road safety and the environment via FORS training workshops and e-learning modules. This applies to HGV drivers and provides a way of identifying any drivers with medical conditions which could restrict their ability to drive with remedial action identified to support any that need it. All our drivers complete a health questionnaire at induction and every 12 months thereafter. We also have subscribed to a cycle to work scheme where staff can enjoy the benefits of purchasing good quality bikes at a discounted price that they can pay in low instalments. This is to encourage all staff to cycle to work and improve fitness levels. Using available software we are measuring our noise levels at the operating centre and customer sites. My comments remain unchanged from the previous year stating that we are proud to be a silver member and then to reach Gold accreditation in August of last year. The FORS scheme continues to support its operators in moving forward and setting standards in road safety and environmental awareness whilst providing us with useful learning tools to increase our fuel efficiency, saving us money and reducing impact on the environment. 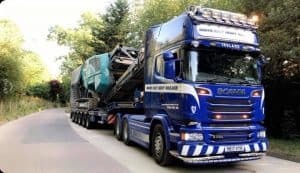 FORS accreditation has given us the support to secure further contracts from reputable companies whilst also helping us to continue to be an efficient haulier to our existing contracts. Going forward we will ensure that we continue to embrace the benefits of the FORS to develop our knowledge and awareness of road safety and the environment, helping us to implement further future innovative improvements as a growing heavy haulage company”.